Dammit Google, fix the text-shadow bug I mentioned in my last post. Do you guys have version number envy? Do You want to have Chrome version number higher than Internet Explorer 9? Why am I using Google Chrome? It’s fast as hell. I did a cold start test – ie, right after a reboot, and it was about 3 seconds for Chrome 6, 14 seconds for Firefox in safe mode. I used the highly scientific one-one-thousand method of timing). Safe mode means no extensions. I also tried turning off the automatic update checks, but that didn’t help either. Chrome is also very fast and robust when you ask it do something like open 20 tabs all at once. However, having said that, I am still using Google chrome as my default browser at home and at work. 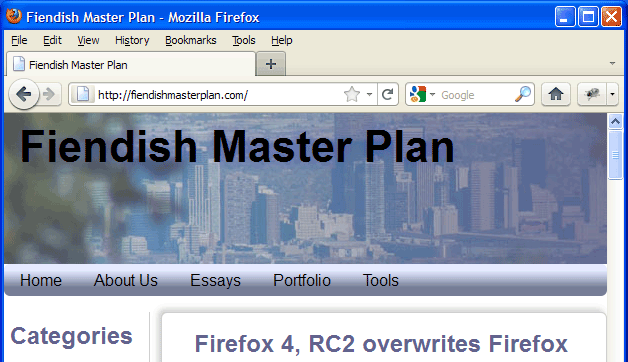 I still use Firefox for web development (gotta have my Firebug). What can I say? Apparently, the extra 11 seconds Firefox takes to start up is in loading the text-shadow rendering. And last, and certainly not least, it’s the browser that has the most CSS3 and HTML5 goodies to play with that isn’t from Apple.